Sintra Full Day Sightseeing Tour departs from Lisbon daily at 9.30 am. Hotel pick-up is usually between 8 am and 8.45 am. This tour operates all year and in all weather conditions. We are comparing Sintra Full Day Sightseeing Tour Prices from leading ticket suppliers and Try to find you Cheap tickets prices on the market. Depart from Central Lisbon on an exclusive full day sightseeing tour on the Portuguese Riviera. No need to wake up early and stumble through the city, because your driver/guide will collect you from your hotel lobby and by 9.30 you'll be cruising out of the city centre and passing through charming scenery on your way to the village of Sintra. The first stop will be at one of the 7 wonders of Portugal, the Pena Palace, where you'll have the chance to discover the magical halls and gardens or admire the stunning sea views from this hilltop building. You'll be led through the grounds on a guided tour to the Quinta Regaleira, a UNESCO World Heritage Site and one of the see the historic Seteais and Monseratte Palaces. And, if you've got a passion for history you can also pay a visit the National Palace of Sintra in the old town centre. After some free time exploring Sintra you'll board the bus again and travel to Cabo da Roca. Enjoy a breathtaking view over the Atlantic Ocean from the westernmost point of mainland Europe and take panoramic pictures of the stunning sea cliffs. You will continue to the village of Cascais, stopping at ‘Hell's Mouth' on the way, and after free time in the picturesque seaside town, you will return by bus to your hotel in Lisbon. On this small group tour you'll benefit from the undivided attention of your bilingual guide, be free to ask any questions you have about the region. You'll also get to know the other passengers taking the tour. This is the perfect tour for seeing visiting Lisbon's coastline and combining history, culture and nature. If you are travelling independently or in a small group and would prefer not to have the hassle of organising your own transport to Sinta and surrounding sights then the full day sightseeing tour would be good for you. Your Experience With Sintra Full Day Sightseeing Tour? Take a day away from the city to visit one of Portugal's best preserved medieval palaces. See one of the 7 wonders of Portugal, Pena Palace, and take a scenic drive to the westernmost point of Europe, Cabo da Roca. Enjoy free time in the village of Sintra. Learn about history and culture from an expert local guide while travelling through a stunning national park. What Sintra Full Day Sightseeing Tour Includes? Round trip transport by air-conditioned bus. Entrance and tour of Regaleira Palace and Pena Palace (if specified). Central Lisbon – Pena Palace/Sintra – Cascais via Cabo da Roca and Guincho Beach – Central Lisbon. Entrance fee to Pena Palace may not be included in the price of the ticket price, you can check this with your tour provider. Travelers Reviews about Sintra Full Day Sightseeing Tour? 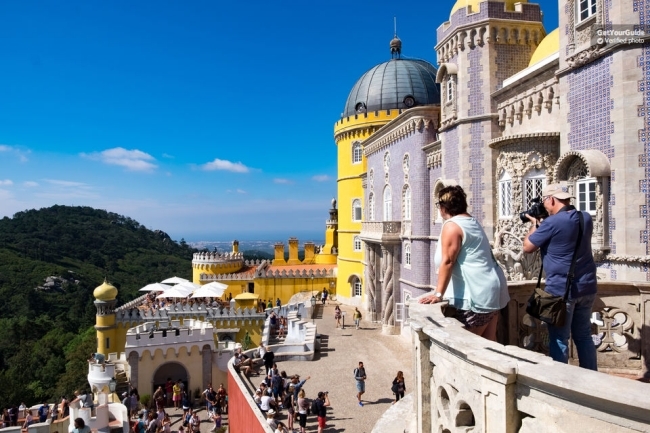 The Sintra full day sightseeing tour has only received a handful of reviews on trip advisor, however, all reviews have been extremely positive, specifically praising the tour guide. Reviewers recommend the Sintra full day tour for any day of the year and for anyone wanting to explore the Portuguese coast. E-ticket or printed tickets are accepted. Tickets are refundable but please check the policy of your ticket provider, charges may incur if cancellations are made less than 7 days in advance and no refund will be issued if cancellations are made less than 24 hours in advance. Tours are available in English, Portuguese, French, Italian, and Spanish and will be conducted in more than one language. Be prepared with a jacket during the winter season and a sunhat, sunscreen and water during the summer. We also recommend wearing flat shoes (tennis shoes or trainers) and comfortable clothing. Food and drinks are not provided on this tour. Collection from your hotel in Lisbon. You must arrange hotel collection with your tour provider, approximate pick-up time will be advised the day before your tour.